There are many different types of sanders out there, each with their own special purpose. You may have heard of all of these types, used some of them, or they may be totally new to you. We hope listing the various types of sanders along with their pictures will prove helpful. Unlike other common tools, sanders often have multiple regional nicknames, making it more difficult to figure out what you’re working with. It should be also noted that most sanders use sandpaper or an equivalent. These start at 60 grit and become finer as the grit count rises. Starting at 60 and working your way up to finer grains will give you a much smoother end product. Which Sander Should You Use? These 11 sanders are used in woodworking and similar projects. Some are hand-held, while others are stationary. They work off of two basic concepts: drums (using a single drum or belt) and flat surfaces (usually round). While most often used for woodworking, some of these sanders can also be found in metal shops or in the plastics industry. 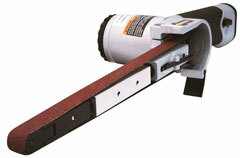 One of the staples in any modern workshop, the belt sander uses a sanding belt wrapped around two drums. The rear drum is motorized, while the front drum moves freely. A tension release lever allows belts to be quickly changed, and most models also have a tracking adjustment knob to help keep the belt centered. Four sizes are available, with the size (in inches) relating to the belt size. Starting with the small 3×18 inch, which is easiest to control and thus usually the best size to learn on. The 3×21 is better balanced than the rest, having good speed, balance, and power, making it the most popular size. Harder to control, the 3×24 can cover a larger surface and is less stable. Finally, the 4×24 was designed for experienced users and can be very hard to control, although it can sand large, flat surfaces in a much shorter amount of time. These sanders are perfect for removing an older finish from wood, such as varnish or paint. Gang sanding (where multiple boards are clamped together) is highly efficient with a belt sander, which is designed primarily to smooth the edges of planks. Due to the power and control available with belt sanders, they are an essential tool for furniture making and other large-scale woodworking projects. When using a belt sander, one should always follow the grain to avoid causing scratches. 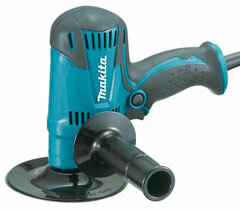 This is an unusual type of sander, as it’s better known as an attachment for power drills, although a table mounted version does exist. These sanders are round discs that spin once added onto the end of any drill. Mounted sanders use a wheel instead of a disc, giving them more surface area. Various grit sizes can be applied to these sanders, depending upon the job. 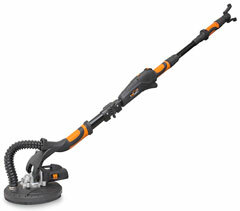 Because of the rotational speed of the disc, the handheld version is perfect for giving a smooth finish to large areas. The stationary version functions well enough that it can be used on metals and plastics as well as wood, and often has an adjustable surface to set your workpiece at angles. 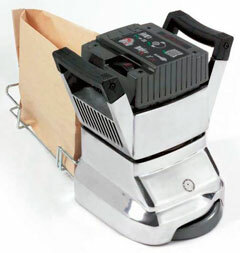 More closely resembling an iron than a sander, the detail sander is a variant of orbital sander with a triangular pad that uses special self-adhesive sandpaper. These small sanders sometimes come with multiple attachments for more specialized or precise work. The peculiar shape of this sander allows it to reach crevices a normal sander can’t get to. It’s used frequently for fitting into corners and around tight spaces, such as the spindles of a chair leg. They can also effectively sand peculiar shapes and are a useful tool for crafts. Looking more like a metal detector than a sander, these are usually disc sanders on a long pole. Some have the handle fitted near the hub for close-up work, while others have rectangular sanding surfaces. Most models incorporate a vacuum to collect dust particles. As the name implies, these sanders are used in the drywall to smooth surfaces and remove excess adhesives. The longer reach on most models allows it to be used on ceilings and other places that would normally require frequently moving a ladder to cover. These sanders are either electric or air powered and have an extremely narrow belt, allowing them to fit into even the smallest of spaces. As a result, they are excellent for detail work and reaching into areas where you may not be able to effectively use regular sandpaper. Orbital sanders are compact tools which can be used one-handed and have excellent handling. They get the nickname of quarter-sheet sander due the the fact that use 1/4 of a standard 9×11 inch sheet of sandpaper, which can be cut by hand. This paper is held onto the flat square sanding surface using two spring-loaded clamps. Many of this sander’s nicknames are derived from the tiny circular orbits in which the sanding pad vibrates. Often referred to as a finishing sander, this tool was built for ultra-fine work, such as removing putty, rounding sharp edges, and creating an ultra-smooth surface. The tools light weight and gentle movement mean it’s poorly suited for heavy removal projects. 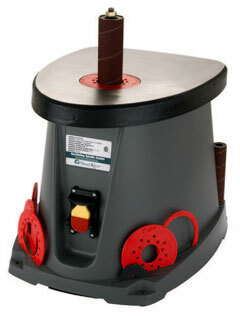 However, this also means that you’ll have a difficult time damaging the surface of your project when using this sander. This mounted sander is part of the drum family. It features a sanding drum which protrudes from a benchtop or freestanding table. As the sander runs, the drum is also raised and lowered on its spindle, allowing the wood surface to come into contact with the entire drum. This not only helps to eliminate grooves, but can reduce wear on the drum surface through its even distribution. The available drum sizes vary, with benchtop models having four inch tall drums ranging from 1/2 to 2 inches in diameter, while the freestanding tables have 4-inch tall drums of up to 4 inches in diameter. 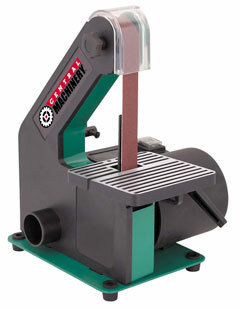 A few models also have an add-on option that can turn the drum into a belt sander which uses standard sanding belts. Oscillating spindle sanders are used primarily for smoothing the edges of boards. Many larger models have the ability to angle the front of the table by up to 45 degrees to create beveled edges. Due to the drum’s vertical design, this tool works perfectly on curved surfaces created by band saws and other tools, while still being able to sand straight lengths efficiently. 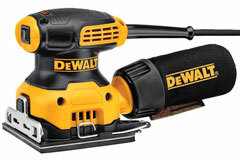 Similar in design to an orbital sander, the random orbital sander has a round pad instead of a square one. This pad spins in circles as well as the small circular orbits of an orbital sander. As a result, the typical swirl pattern left behind by regular orbital sanders is all but eliminated. Pads sizes are available in either five or six inch diameters, and may either use PSA (pressure sensitive adhesive) discs or discs with a velcro-like surface, depending upon the model. In addition, while D-handle and barrel-grip variants are available, the most popular design uses a one-handed palm grip. This is an excellent all-around sander. It can perform the functions of both a belt sander and orbital sander (stock removal and ultra-smooth sanding), although less efficiently than those sanders. As a result, it can be found in many workshops and is often the only sander in limited budget toolkits due to its versatility. Unlike the rest of the sanders in this list, the sanding block doesn’t require power. Instead, it refers to an entire range of hand sanders that have a surface for attaching sandpaper and some form of handle or grip surface. A few of the popular grips include a handle similar to that of a hand saw, a solid block, simple bar handle, or even an ergonomic palm surface. 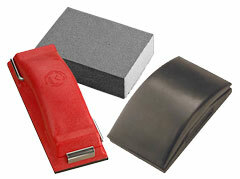 The foam sanding block is one of the most popular types in use today. These are some of the oldest sanders still in use and are great for crafts and toolboxes due to their small size and simple design. As they require no electricity, they can be used for wet sanding and in locations that have no power. They can require some skill to get the best finish, but are a lot easier to control that most electric sanders. These stationary belt sanders often also include a disc sander. 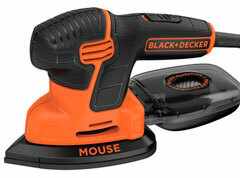 They’re big and powerful, making them popular in larger woodworking shops and industrial factories. Taut belt models are the most commonly used, although somewoodorking industries use a belt that has some slack in it for more control. Due to its high power, table sanders are poor choices for precision work, and can remove large amounts of material quickly. Slack belts are popular in guitar making, and the sander can be used to create a smooth finish when a fine grit paper is used. This category of sander actually contains a few different types of sander. The distinguishing features of these are their use in stripping and prepping floors and their generally larger size. There are two basic varieties of floor sander, drums and edgers. 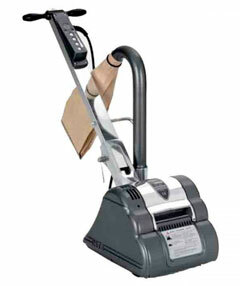 As with all members of the drum family, a floor drum sander is heavy and powerful. It requires two people to transport and is usually rented. Because of the amount of power, it can be easy to lose control of this sander if you aren’t careful, creating gouge marks in the floor. Drum sanders are pushed, much like a lawnmower, and can be used to remove paint, adhesives and other unwanted substances. Note that a larger version of the random orbital sander may also be used for large floor areas, although not as commonly. The second heavy-duty floor sander, this machine makes quick work of floor refinishing.These disk sanders are used to reach places where a drum sander can’t, such as the edges of floors and stair surfaces. Larger than regular sanders, they are still smaller than the floor drum sander and are held close to the ground. Like the drum sander, a floor edging sander is a powerful tool that should be handled with care. Otherwise, floor damage or even injury to the operator may occur. When getting ready for a job, you will always want the best sander for the type of work you’ll be doing. Of course, many sanders sound similar, so which should you grab? 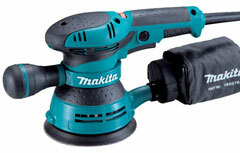 The following are two common sticking points for choosing the right sander. These two are very similar on the surface, but have a lot of differences when in use. The random orbital sander requires more skill to use, but can be used for longer periods of time due to the lower vibration. It can also perform almost any task once you get the hang of it. For this reason, a random orbital sander should be your first choice if you can only afford to buy one sander for your tool kit. Unlike the situation above, belt and orbital sanders are very different in form and function. Both can be used for finishing to an extent, but the task will define which to use. When on a tight budget, it’s usually best to go for a belt sander, as it’s easier to finish a project by hand sanding than to start one. Which is the best sander to use for kitchen cabinets? I want to paint over stained wood. Can I strip a popcorn ceiling down to the concrete with a sander? I don’t think the drywall sander will get close enough. I’ve never even considered attempting to strip the popcorn with only a sander. Always did the wet and strip method followed by a sander. It should be doable with a drywall sander (if unpainted) and 80 grit paper but I wouldn’t recommend it. You also need to be absolutely sure there is no asbestos in the texture. Wetting it so it clumps and falls to the floor is a lot safer than making it airborne via sanding.